David Greer, 33, strains to hold up this 50-pound [23 kg. ], 38-inch [97 cm.] blue channel catfish. 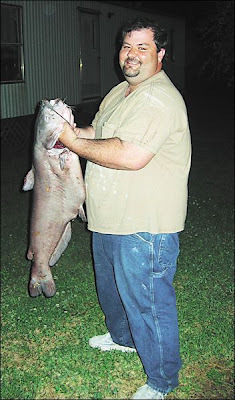 Greer’s fish breaks the old record on Buhlow Lake for blue channel catfish by 22 pounds [10 kg]. Dry Prong’s Rebecca L. Connella held the previous record with a 28-pound [13 kg] channel cat. Greer's catfish measured 38-inches in length, had a massive 24-inch [61 cm.] girth, and weighed 50 pounds. The fish's mouth was so large that the 33-year-old could take fit both his fists in there at the same time. "I got about 32 pounds [15 kg.] of filets from him. I gave away half of it to some of my friends who seem to like free fish, had a fish fry for my dad's birthday and I still managed to have several packs of filets left over," Greer said. 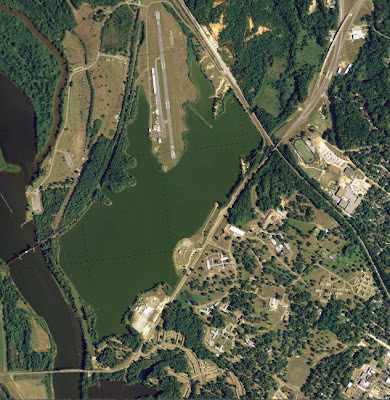 Before Greer's catch, the largest channel catfish caught out of the lake was by Dry Prong's Rebecca L. Connella in January 2004. Her prize weighed 28 pounds. Greer's fish surpasses her record by 22 pounds. An avid catfish angler, Greer, who once caught a 5-pound [2 kg.] bass when he was 12, claims he "doesn't have patience for all the other kinds of fish. "People know where I am going when they see my little red truck," he said. "I fish that same spot over and over again. I used to fish there every other evening, but it's been harder what with work and all. Still, I try to go as often as I can." And Greer's "spot" -- the cul-de-sac at the end of the road on the north end of the lake -- is usually entirely his. "A few people stop there, but there doesn't seem to be too many," he said. "The spot has always been a productive one." Little did he realize how productive it would be on April 3 a little after 7 p.m.